"It is important you develop a partnership with a veterinarian prior to an emergency." 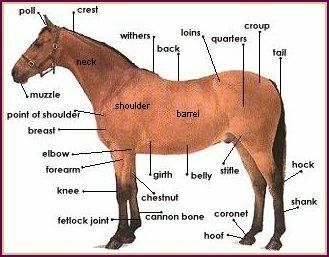 Learn the parts of your horse and the names for the parts on a saddle & bridle. Develop a partnership by consulting your veterinarian for routine and preventive horse health care. Vaccinations: Your horse should be vaccinated at least once a year, typically in the spring. What vaccinations your horse requires is determined by age and overall health. The time of year also influences the risk of infectious diseases, such as West Nile. Your veterinarian can recommend what vaccinations are needed for horse health care. Symptoms can be confused with rabies, Possum Disease, equine encephalitis, or other serious neurological diseases. Contact your veterinarian if you see any of these signs in your horse; Stumbling or tripping, Muscle weakness or twitching, Partial paralysis, Loss of appetite, Depression or lethargy, Head pressing or tilt, Impaired vision, Wandering or circling, Inability to swallow, Inability to stand up, Fever, Convulsions, Coma. Parasite Control: Your horse needs to be de-wormed several times each year. The current recommended de-worming program is to alternate de-worming products annually. One de-worming product is used over the course of a year followed by a different de-worming classification (mebendazole, organosphosphate, avermectine, etc.) the next year. Most de-wormers must be used every 60 days. Paste de-worming is as effective as tube de-worming. It is best to consult with your veterinarian when establishing a a de-worming program. Clean out old de-worming tubes and use to dispense tablets to your horse. Crush the tablets (a small coffee grinder works great) and put into the tube. Add a little bit of water or fruit juice and shake until a paste forms. Then administer it like you would a de-wormer. Dental Care: Teeth should be checked by a veterinarian once a year as part of horse health care. Your horse's teeth may need to be filed due to uneven wear from the grinding motion used while eating. Symptoms of improper chewing include feed falling from your horse's mouth while chewing, your horse holds its head to one side to chew, wasted feed, excessive slobbering, indigestion, and large amounts of whole grain in the feces. Your horse's teeth may need to be checked if it is starting to take longer for it to clean up its feed. Conversely, sore spots in the mouth may cause horses to bolt their feed to reduce the amount of time the sore is irritated. Strong, sour odors from the mouth can be indications of tooth cavities or food particles lodged in the mouth. Floating (filing) the teeth may be necessary to remove sharp edges. Tip: Does your horse eat, but seems to be losing weight? Or maybe is not handling as well while riding? Your horse's teeth may need to be floated (filed). The teeth may have grown some sharp points making it difficult to grind food or causing discomfort. First Aid: Keep a first aid kit handy containing bandage material, a thermometer, and ointments. Your veterinarian can consult with you on what is appropriate to have in the first aid kit. Contact your veterinarian any time your horse appears sick, disoriented, or has been injured. Tip: What are the minimum supplies that should be kept in your horse's first aid kit? Vitamin and Mineral Supplements: There are lots of different mineral and vitamin supplements on the market. Feeding excessive levels can cause problems for horses. Use commercially prepared supplements only at the recommended levels. If feeding your horse a grain concentrate, check the ingredients. Often the concentrate will provide all the necessary vitamins and minerals your horse needs without needing to add any additional supplement. Foot Care: Clean your horse's hooves before and after you ride. Examine all hooves frequently for problems. Hooves need to be trimmed regularly. Most horses need to have their hooves trimmed, or shoes reset every six to eight weeks, though the need for hoof care varies with the use and age of your horse. A qualified farrier can make recommendations for your horse. Tip: What is the easiest and single most important thing you can do to care for your horse's hooves? Pick out your horse's feet! It's pretty basic and doesn't require a lot of time.